Did you know that salt cave therapy can help Eczema suffers? People share their experiences here. My Eczema has been a persistent cause for concern and I have resorted to salt therapy almost in desperation! I heard about Little Himalaya’s new salt cave opening up in my home town of Kenilworth and thought I may as well try it. I’ve had 6 sessions so far and although my Eczema is still an issue, I’m fairly certain that I can see a difference compared to before. I should probably take photos to measure my progress! Just want to say also, the salt cave is sooooo relaxing! I’ve fallen asleep in most of my sessions! My mum tried a few sessions at her local salt cave to help with her psoriasis and mentioned that it might help my Eczema. I decided to join her for a few sessions and my skin does appear to be improving slowly. Nothing major but then these things do take time. The early signs are certainly encouraging. My son has suffered with eczmea since he was a baby. It’s even worse when we attempt to doing anything involving water. This year his eczema was very bad. Nothing seemed to help. Very painful and very itchy. We were introduced to the salt cave and went for a free trial session. We started to notice a difference just after 3 sessions! 7 sessions – completely gone! Went along to the salt rooms with my two daughters, as we all suffer from Eczema to varying degrees. They were very accommodating as they allowed us all in together and I only had to pay for a children’s session too, which was good. The lady in reception was extremely friendly and helpful, and told us everything we could possibly need to know about how salt therapy works. She even showed us the little ‘control room’ where the machine is that pumps out all the salt. My daughters were absolutely fascinated. We all really enjoyed our session- the kids and I loved the reclining chairs and listening to the nice ocean sounds coming through the speakers, the salt on the floor even looked a bit like sand so we all pretended that we were on the beach! The only problem was that when it was all over none of us wanted to leave! Obviously the real reason we went for the sesssion was to help our skin conditions. Well, I’ve been back with my daughters on half a dozen occasions since and although I haven’t necessarily noticed an improvement in my own skin, one of my daughters is definitely looking better now- even one of her friends commented to her at school the other day. We all love the sessions so much that we’ll be continuing to go regardless, hopefully in a few more weeks the results will be more obvious in all of us. I saw an advert for salt therapy in a magazine and was immediately intrigued- I’d never heard of it but I’m really into anything that’s a bit alternative and non-mainstream, especially when it involves something as natural as salt. 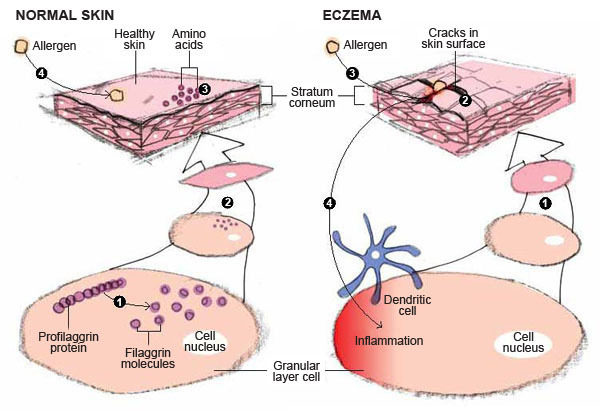 I dug a bit deeper and read some interesting reviews from people suffering from skin complaints such as Eczema, which is something I’ve unfortunately suffered from my whole life. I’ve given everything under the sun a try in order to make it better, with varying degrees of success. I’ve only had a couple of salt cave sessions so far and it’s too early to report on the results of my Eczema but I have a good feeling about this therapy. My skin feels nice and smooth after the sessions and I think it is looking more radiant. Interestingly, my breathing is noticeably better already, even though i thought it was good in the first place! I will be returning to salt therapy regularly over the coming weeks and hope to have more good things to report soon! Time will tell, but my skin feels and looks better. I was given a gift voucher for the salt cave by my friend and I hadn’t even heard of salt therapy! An added bonus is that the experience itself was so relaxing and enjoyable. I found the staff to be extremely helpful too, it’s a nice set-up overall.